The Radio Free Charleston Podcast Returns with Sheldon Vance, Whistlepunk, J Marinelli, GarageCow Ensemble, Appalachian Swing and a Brief Tribute to Joe Dobbs. We are back from a nearly month-long hiatus that we took so that we could bring you The ShockaCon Horror Show podcast. That was our special “event” podcast, hosted by Lee Harrah and designed to raise awareness of ShockaCon 4, the horror and science fiction convention that just happened last weekend. Scroll down this blog a bit and you can find all nine episodes. Now we are back with a show bursting at the seams with music. We are not going to have a theme in our second hour, but we will bring you some themed four-song sets. 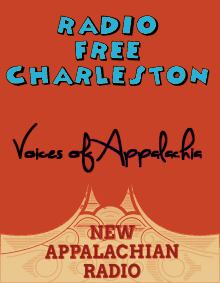 For the time being, Radio Free Charleston V3 is operating as a podcast, hosted at Voices of Appalachia. We hope to get the streaming service back online soon. You can listen to the show in this widget [HERE] or look if that’s not working or turning into a widget like it’s supposed to, right click on it and save it as a download, or open it in a new window to listen, or you could just click over to Voices of Appalachia. We’re trying to cover all our bases here. We do have a somber note on which to begin the show this week. Joe Dobbs, a musician, radio host and the owner of Fret N Fiddle in Saint Albans passed away September 21 after a short illness. Joe was an amazing person, a friend, mentor, confidante and inspiration to generations of area musicians. We’re going to dive into the music this week with a track from his band, The 1937 Flood. Our first mini-theme set features music from Douglas Imbrogno and his Garagecow Ensemble, which was the album project he put together to sketch our the concepts for “St. Stephens Dream,” a multi-media performance concept with a cool narrative that I’d love to see him revisit someday. We bring you four songs from this album. We don’t have a full-blown theme in our second hour, but we do have a swing mini-set, opening again with a track from the late Joe Dobb’s band, The 1937 Flood. We wrap up the show with a fun mix of old and new local music.